This drama is depicted on at least two other seals from the ancient Indus metropolis. In other scenes from Harappa, this is a female deity standing on an elephant with a spoked wheel sign above her head (see Deity Strangling Tigers Tablet). Asko Parpola writes: "The 'contest' motif is one of the most convincing and widely accepted parallels between Harappan and Near Eastern glyptic art. A considerable number of Harappan seals depict a manly hero, each hand grasping a tiger by the throat. In Mesopotamian art, the fight with lions and / or bulls is the most popular motif. 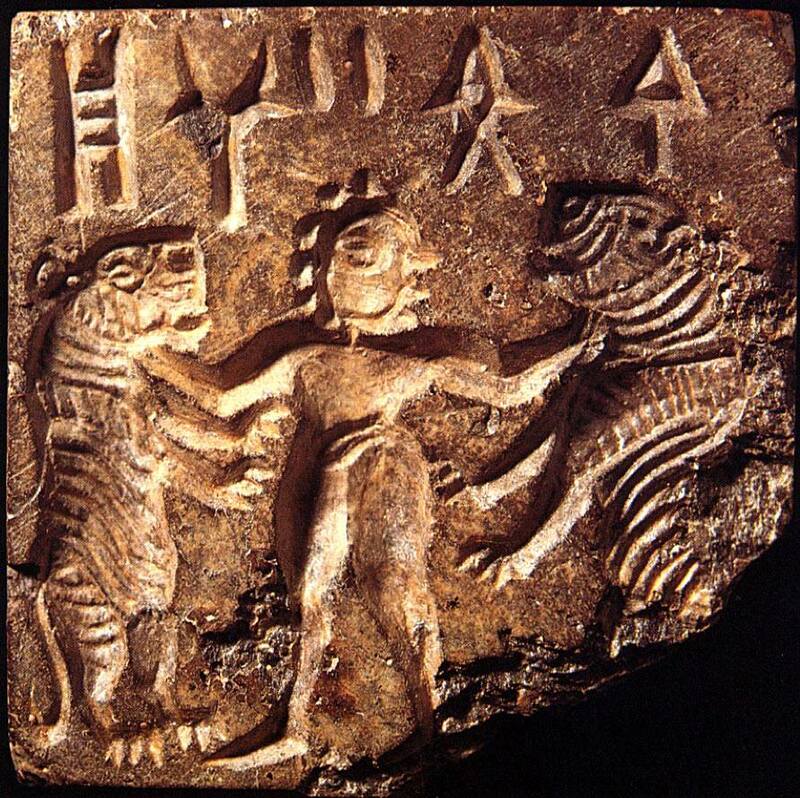 The Harappan substitution of tigers for lions merely reconciles the scene with the fauna of the Indus Valley ... The six dots around the head of the Harappan hero are a significant detail, since they may correspond to the six locks of hair characteristic of the Mesopotamian hero, from Jemdet Nasr to Akkadian times," (Deciphering the Indus Script, pp. 246-7).